The changes to Maps in iOS 6 may have gotten the lion’s share of negative coverage since the iPhone 5 debuted. But back on September 12, when the company announced the latest iPhone and iPod models, the harshest criticism was reserved for the Lightning connector, Apple’s replacement for the venerable 30-pin dock connector. The new plug has some clear benefits. Its size allows Apple to create thinner and smaller devices; its design means you can’t insert the Lightning connector the wrong way; and Apple says it’s much more durable than the older 30-pin connector. The problem, of course, is that none of the thousands of 30-pin accessories on the market—and in people’s homes, cars, or offices—work with the Lightning connector. The latest iPhone and iPods include a USB-to-Lightning-connector cable, but you don’t get any sort of adapter for using the new devices with older accessories. For that, you’ll need to turn to Apple’s $29 Lightning to 30-pin Adapter or $39 Lightning to 30-pin Adapter (0.2 m), which is the cable version. Each of these adapters lets you connect 30-pin-dock-connector accessories to the latest iPhone and iPod models by offering a Lightning-connector plug on one end and a female 30-pin port on the other. You insert the Lightning-connector plug into your iPhone 5, seventh-generation iPod nano, or fifth-generation iPod touch, and then attach the 30-pin end to the dock connector of your favorite speaker system or other compatible accessory. 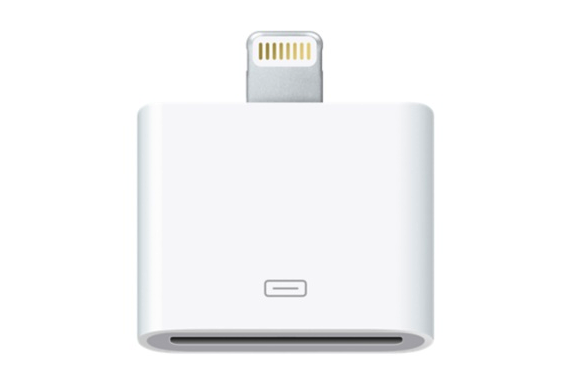 The main difference between the two adapters is that the standard version is a single piece, just 0.8 inches long (not including the Lightning plug), while the cable version separates the 30-pin port from the Lightning plug with a flexible, 7.5-inch (20 cm) cable that’s a little thicker and stiffer than Apple’s standard Lightning to USB Cable. The two adapters function identically. Nearly a month after they were announced, and three weeks after the iPhone 5 itself hit the streets, both adapters are now available. I’ve been testing them for compatibility, and here’s what I’ve found. According to Apple, the adapters support analog and USB audio, as well as syncing and charging, although there are some technical caveats. Speakers and audio docks: I tested both adapters with a range of dock-cradle speakers and audio-focused standalone docks using the iPhone 5 and the latest iPod touch and nano models. For playing audio, the adapters worked perfectly with every speaker dock and audio dock I tested, both old and new. This includes newer speakers and audio docks that grab your player’s digital-audio (specifically, USB-audio) output and then use a digital-to-analog converter (DAC) in the speaker or dock itself to produce an analog signal. But the adapters also work with speakers and docks—generally older models—that require an analog-audio signal. These speakers connect to dedicated analog-audio pins in the 30-pin connector, relying on the iPhone or iPod to handle the digital-to-analog conversion. The challenge here is that the Lightning connector doesn’t offer analog-audio pins—the new connector is all digital. The solution (and likely part of the reason that Apple’s adapters aren’t cheap) is an actual DAC built into each adapter. In other words, the adapter is converting the iPhone or iPod’s digital-audio output to an analog signal and then sending that analog signal to the appropriate pins in the 30-pin connector. As an example, thanks to Apple’s adapters, I was able to use the latest iPhone and iPods with Logitech’s mm50 speaker system, an old favorite from 2005. That covers audio playback, but what about charging through a speaker dock? That depends on the circuitry the accessory uses to charge an iPhone or iPod. The first dock-connector iPods charged via FireWire, so early docking speaker systems were designed to charge your iPod via the 30-pin connector’s FireWire-power pins. But starting with the first Windows-compatible iPods, you could charge via FireWire or USB; and eventually USB became the only way to charge. (Specifically, the iPhone 3G and later, the second-generation and later iPod touch, the fourth-generation and later iPod nano, and the 2008 and later iPod classic charge only via the 30-pin connector’s USB-power pins.) So accessory vendors eventually migrated to providing charging power only via USB-power pins.